How is mid- October treating you? As much as I miss the balmy days of summer, I have to admit I love Fall! The weather gets crisp enough to really get creative with fashion and layering, and it is really nice being able to run around all day and not turn into a sweaty mess. Plus hello gorgeous leaves everywhere! In the spirit of the new season, I’m sharing some of my favorite Fall activities, a few tips on how you should dress for each one, and the one thing that you have to have in your bag for all of them - V8 +HYDRATE™! 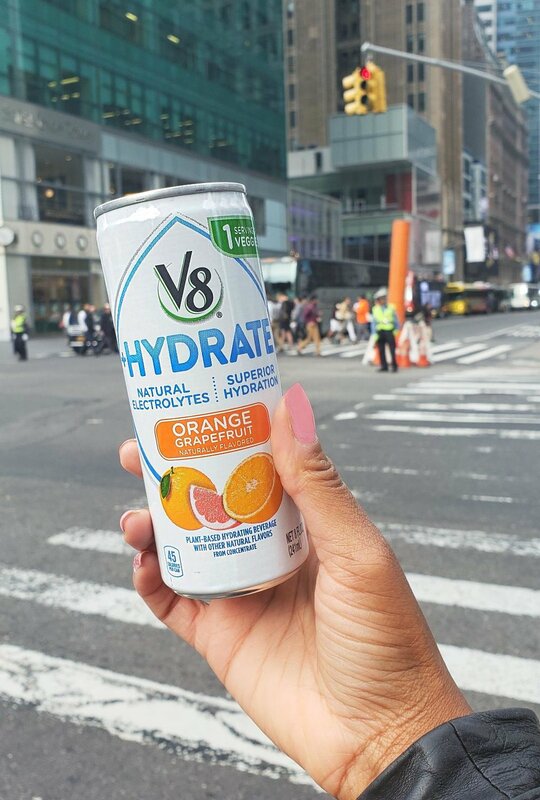 V8 +HYDRATE™ is a plant-powered hydration beverage that offers superior hydration with a blend of natural electrolytes from vegetables and hints of fruit, so you can replenish quickly when you are on the go! Staying hydrated is probably the most important beauty or lifestyle tip I could ever give you guys and no matter how busy I am, I always make it a priority. V8 +HYDRATE™ makes it easy, with the great taste and travel-friendly can so you can always have one handy. Now you just have to figure out how you want to spend the perfect Fall Saturday. Sometimes Fall weather calls for some indoor fun, and it’s a great time to catch up on exhibits you may have missed during summer when you were too busy on the beach or at the hottest rooftop bar. If your city has a great museum scene, make a list of the ones you can’t miss and plan a day to explore them all. Since that means you’ll be on your feet a lot, walking around and probably waiting in a few lines, the day calls for a stylish but comfortable look. I like the idea of a casual chic dress, lightweight blazer or jacket, and ballet flats or loafers. I usually keep my bag pretty small and light since carrying something heavy all day gets really tough on my shoulders, so you’ll catch me with a mini bag for the essentials! Being on your feet all day can dehydrate you faster than you think. This is why I carry my new favorite hydration beverage with me. Sometimes nothing beats getting out of the city for a day! I love to round up the squad and drive up to the Hudson Valley area for a day of apple or pumpkin picking. You can find beautiful orchards just about an hour away from the city, and there are usually also adorable farms and markets that sell everything from locally made honey to fresh baked cider donuts. My go to look for this kind of day trip is comfy jeans or leggings, an oversized knit cardigan, and flat boots, and a bag big enough to hold my essentials for the day. TBH, I hate concerts in the summer, even though they are super popular then. Call me crazy but I’d prefer to not be surrounded by a jam-packed room of hot sweaty people. Fall lineups are usually more my thing! Some of my fave venues are Terminal 5 and Music Hall of Williamsburg for small acts and buzzworthy names. Check out their lineup or who is on tour and may be heading to your city! My go to concert look varies depending on what kind of band is going on, but pretty much always involves some combo of graphic T and jeans or skinny leather leggings. Since you typically can’t bring your own beverages into a venue, hydrate before the show and after you get home with V8 +HYDRATE™. You’ve gotta keep your energy up to get through the show! Plus it makes for the perfect morning recovery beverage after your night out. Make sure to get V8 +HYDRATE™ on Amazon or Amazon Pantry! You can place your order and have it before you know it thanks to Amazon Prime’s lightning fast shipping. And they have a great promo on site so you can take 30% off V8 +HYDRATE™ while supplies last. Just use the promo code 30V8Hydrate1 at checkout! There are 3 flavors available: Strawberry Cucumber, Orange Grapefruit and Coconut Watermelon, so stock up and try them all while you can save! Be sure you and your girl or guy friends are staying hydrated! It’s clean, crisp, and has a delicious taste, and you can buy a 24 pack that’s perfect for sharing on Amazon! Let me know what you are looking forward to most this Fall, and of course how you plan to dress!